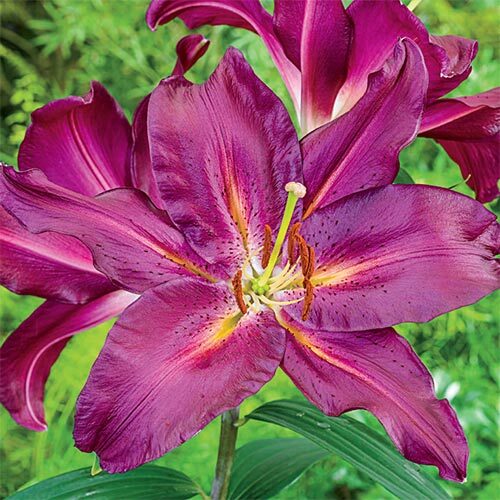 This gorgeous Oriental Lily has dramatic 9" flowers with deep purple-red petals and small white centers. Fragrant blooms are held on sturdy stems and grow to a height between 42-48". Flowers for years, producing highly scented blossoms—its fragrance permeates the garden air. Leave bulbs in the ground for even more flowers the following year, Gran Turismo is great for perennializing. Blooming later in the season than most other lilies, this exotic beauty is truly spectacular in color and size. Demand and interest in Oriental Lilies has grown dramatically. Don't miss out on the opportunity to grow this seldom offered variety!